texas feet, new glasses and the gps | is there any more pie? Posted on August 21, 2013	by is there any more pie? I have a lot of pictures from Harley Chick’s visit last weekend to share, but tonight I’m going to bed early. I have a lot to catch up on, I know, so be patient with me. Okay, so…Texas feet. That’s what I say when my feet hurt, which is usually in Texas. And no, not because I’m wearing new or used cowboy boots. I have bad luck with shoes and sandals, and walking on Austin’s uneven sidewalks and standing at music venues gives me “Texas Feet”. Today I drove Banjo Man to the airport in the Great Big City a hundred miles away. I was sad. Banjo Man was sad. Kiss, kiss. Wave, wave. And then I grabbed the GPS to find my way to Lenscrafters, because my glasses broke again this morning. The arm of one side is broken and sometimes the screw comes out. I need new glasses, but I haven’t had time (since last December, according to the new prescription) to get them. Huh. Where does the time go? So I went to the Great Big Mall on the way home. I haven’t been to a mall in years, unless I count the twenty minutes in Austin for my Darling Grandson to have his picture taken with the Easter Bunny. The kid frowned at the big white rabbit the whole time. Hilarious. Anyway, I parked in front of the food court doors and wandered around like a homeless person until I spotted Lenscrafters. They couldn’t make me new glasses if I picked out new frames because something was out of stock. But the woman replaced the screw in my old glasses and I was good to go. But first…new shoes??? I had that new pair of black Crocs but they were more of a winter style, and hot, so I thought I’d look for something like sandals. I limped into a discount shoe store and found a pair of Dr. Scholl sandals with a gel heel. Heaven. I bought them, but there was a sale that was “Buy One Get One Half Price”, so the salesclerk (who couldn’t quite believe I didn’t want to shop for a second pair) gave me a rain check card for a half-price pair. 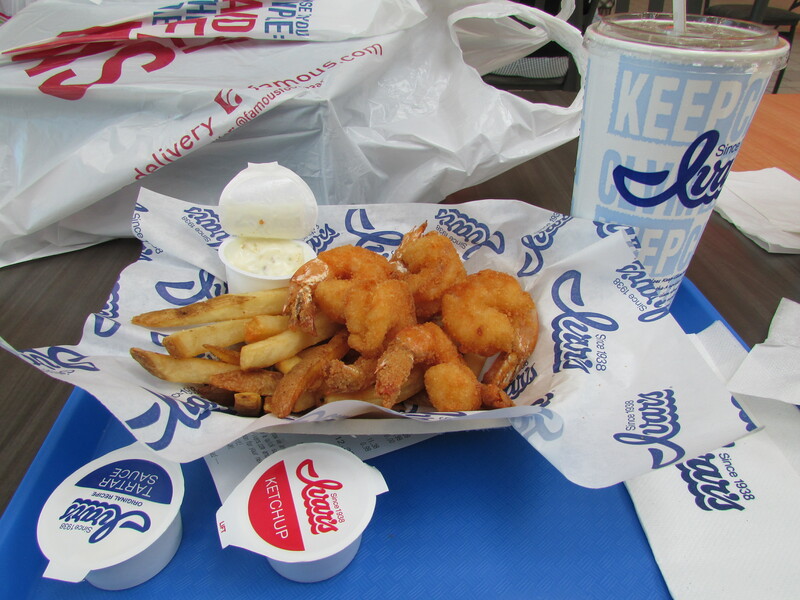 I splurged on fried prawns in the food court. And watched the kids and mothers shop for school clothes. They all seemed very calm, which isn’t what I remember about shopping for school clothes, but that’s another blog post for another day. A question about Mall Etiquette from a non-maller: Is it okay to approach a stranger with three children to offer your half-price shoe coupon to her? The coupon was refused. Politely. I moved on, with the help of the GPS and google, to a Crocs store 8 miles east, near Cabela’s. It turned out to be a dead end empty lot at the edge of the Cabela’s parking lot. So I went into Cabela’s, hoping that there would be Crocs there. And there were a few, very large camouflage-print Crocs. I was tempted, of course, so I would look good on my next bear hunt. Back in the car, with a Cabela’s diet coke and no Crocs, I asked the GPS for directions to a quilting store. According to the device, it no longer existed. Or never had. 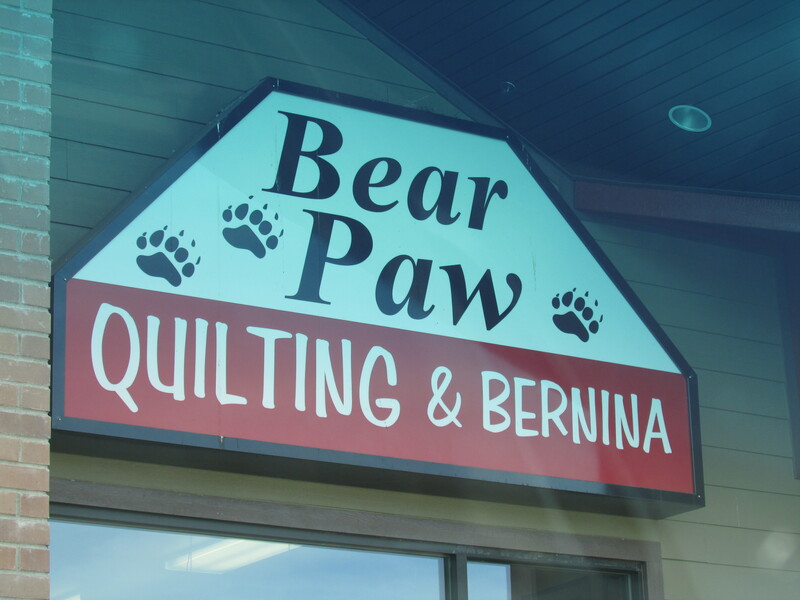 I decided to go there anyway, because I needed something specific to finish a quilt top and it was on the way home and what a shame if that store had gone out of business like so many other quilt shops had. The GPS was wrong again, only this time that was a good thing. I found the fabric I needed and hurried home to the lake and the mountains and the woods. Off to fiddle a little while…and put my feet up. It’s good to be home. This entry was posted in a more pie opinion, lake. Bookmark the permalink. You’ve had quite a day! You must have fallen asleep when you’re head hit the pillow.